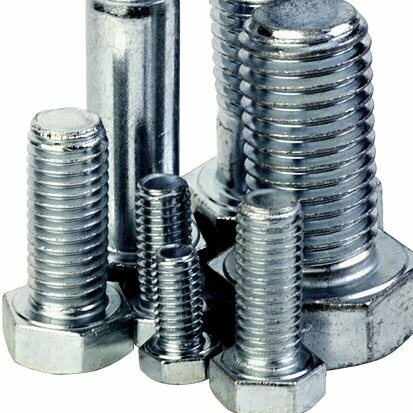 Stainless Steel Fasteners come in a varity of head styles, diameters and lengths - Maintenance Products Inc. Stainless Fasteners basicly come in two different grades 18-8 and 3-16 alloys, a varity of heads, diameters and lengths . Stainless is often a good choice when the application calls for a stronger metalic fastener and the head or thread charastics don't allow for a heat treated hex or socket cap screw of greater strength.18-8 stainless 100,000min tensile strength, 3/4" and above 85,000 min psi, hardness is a B80 Rockwell over 3/4" . 18-8 Alloy balances tensile stength with corrossion resistance (chromium and nickle content), not recommended for underwater applications. ASTM 300 series , Lubricate when using air tools to prevent galling. 3-16 with molybdeum is available for more corrosion resistance at a much higher cost.